Musings on Markets: The Bitcoin Boom: Asset, Currency, Commodity or Collectible? As I have noted with my earlier posts on crypto currencies, in general, and bitcoin, in particular, I find myself disagreeing with both its most virulent critics and its strongest proponents. Unlike Jamie Dimon, I don't believe that bitcoin is a fraud and that people who are "stupid enough to buy it" will pay a price for that stupidity. Unlike its biggest cheerleaders, I don't believe that crypto currencies are now or ever will be an asset class or that these currencies can change fundamental truths about risk, investing and management. The reason for the divide, though, is that the two sides seem to disagree fundamentally on what bitcoin is, and at the risk of raising hackles all the way around, I will argue that bitcoin is not an asset, but a currency, and as such, you cannot value it or invest in it. You can only price it and trade it. Cash Generating Asset: An asset generates or is expected to generate cash flows in the future. A business that you own is definitely an asset, as is a claim on the cash flows on that business. Those claims can be either contractually set (bonds or debt), residual (equity or stock) or even contingent (options). What assets share in common is that these cash flows can be valued, and assets with high cash flows and less risk should be valued more than assets with lower cash flows and more risk. At the same time, assets can also be priced, relative to each other, by scaling the price that you pay to a common metric. With stocks, this takes the form of comparing pricing multiples (PE ratio, EV/EBITDA, Price to Book or Value/Sales) across similar companies to form pricing judgments of which stocks are cheap and which ones are expensive. Commodity: A commodity derives its value from its use as raw material to meet a fundamental need, whether it be energy, food or shelter. While that value can be estimated by looking at the demand for and supply of the commodity, there are long lag and lead times in both that make that valuation process much more difficult than for an asset. Consequently, commodities tend to be priced, often relative to their own history, with normalized oil, coal wheat or iron ore prices being computed by averaging prices across long cycles. Currency: A currency is a medium of exchange that you use to denominate cash flows and is a store of purchasing power, if you choose to not invest. Standing alone, currencies have no cash flows and cannot be valued, but they can be priced against other currencies. In the long term, currencies that are accepted more widely as a medium of exchange and that hold their purchasing power better over time should see their prices rise, relative to currencies that don't have those characteristics. In the short term, though, other forces including governments trying to manipulate exchange rates can dominate. 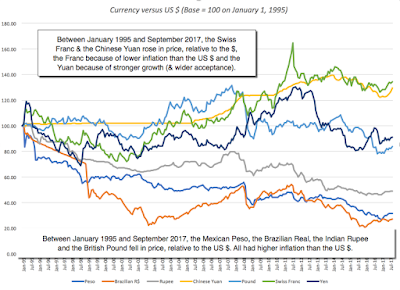 Using a more conventional currency example, you can see this in a graph of the US $ against seven fiat currencies, where over the long term (1995-2017), you can see the Swiss Franc and the Chinese Yuan increasing in price, relative to the $, and the Mexican Peso, Brazilian Real, Indian Rupee and British Pound, dropping in price, again relative to the $. Collectible: A collectible has no cash flows and is not a medium of exchange but it can sometimes have aesthetic value (as is the case with a master painting or a sculpture) or an emotional attachment (a baseball card or team jersey). A collectible cannot be valued since it too generates no cash flows but it can be priced, based upon how other people perceive its desirability and the scarcity of the collectible. Viewed through this prism, Gold is clearly not a cash flow generating asset, but is it a commodity? Since gold's value has little to do with its utilitarian functions and more to do with its longstanding function as a store of value, especially during crises or when you lose faith in paper currencies, it is more currency than commodity. Real estate is an asset, even if it takes the form of a personal home, because you would have had to pay rental expenses (a cash flow), in its absence. Private equity and hedge funds are forms of investing in assets, currencies, commodities or collectibles, and are not separate asset classes. The key is that cash generating assets can be both valued and priced, commodities can be priced much more easily than valued, and currencies and collectibles can only be priced. So what? I have written before about the divide between investing and trading and it is worth revisiting that contrast. To invest in something, you need to assess its value, compare to the price, and then act on that comparison, buying if the price is less than value and selling if it is greater. Trading is a much simpler exercise, where you price something, make a judgment on whether that price will go up or down in the next time period and then make a pricing bet. While you can be successful at either, the skill sets and tool kits that you use are different for investing and trading, and what makes for a good investor is different from the ingredients needed for good trading. The table below captures the difference between trading (the pricing game) and investing (the value game). The price is the only real number that you can act on. No one knows what the value of an asset is and estimating it is of little use. Every asset has a fair or true value. You can estimate that value, albeit with error, and price has to converge on value (eventually). You try to guess which direction the price will move in the next period(s) and trade ahead of the movement. To win the game, you have to be right more often than wrong about direction and to exit before the winds shift. Price is determined by demand & supply, which in turn are affected by mood and momentum. Value is determined by cash flows, growth and risk. Incremental information (news, stories, rumors) that shifts the mood will move the price, even if it has no real consequences for long term value. Only information that alter cash flows, growth and risk in a material way can affect value. Can be very short term (minutes) to mildly short term (weeks, months). Be able to gauge market mood/momentum shifts earlier than the rest of the market. Be able to “value” assets, given uncertainty. Momentum shifts can occur quickly, wiping out months of profits in a few hours. The price may not converge on value, even if your value is “right”. Capacity to move prices (with lots of money and lots of followers). Can provide the catalyst that can move price to value. A trader who thinks he is trading based on value. A value investor who thinks he can reason with markets. As I see it, you can play either the value or pricing game well, but being delusional about the game you are playing, and using the wrong tools or bringing the wrong skill set to that game, is a recipe for disaster. The first step towards a serious debate on bitcoin then has to be deciding whether it is an asset, a currency, a commodity or collectible. Bitcoin is not an asset, since it does not generate cash flows standing alone for those who hold it (until you sell it). It is not a commodity, because it is not raw material that can be used in the production of something useful. The only exception that I can think off is that if it becomes a necessary component of smart contracts, it could take on the role of a commodity; that may be ethereum's saving grace, since it has been marketed less as a currency and more as a smart contracting lubricant. The choice then becomes whether it is a currency or a collectible, with its supporters tilting towards the former and its detractors the latter. I argued in my last post that Bitcoin is a currency, but it is not a good one yet, insofar as it has only limited acceptance as a medium of exchange and it is too volatile to be a store of value. Looking forward, there are three possible paths that I see for Bitcoin as a currency, from best case to worst case. The Global Digital Currency: In the best case scenario, Bitcoin gains wide acceptance in transactions across the world, becoming a widely used global digital currency. For this to happen, it has to become more stable (relative to other currencies), central banks and governments around the world have to accept its use (or at least not actively try to impede it) and the aura of mystery around it has to fade. If that happens, it could compete with fiat currencies and given the algorithm set limits on its creation, its high price could be justified. Gold for Millennials: In this scenario, Bitcoin becomes a haven for those who do not trust central banks, governments and fiat currencies. In short, it takes on the role that gold has, historically, for those who have lost trust in or fear centralized authority. It is interesting that the language of Bitcoin is filled with mining terminology, since it suggests that intentionally or otherwise, the creators of Bitcoin shared this vision. In fact, the hard cap on Bitcoin of 21 million is more compatible with this scenario than the first one. If this scenario unfolds, and Bitcoin shows the same staying power as gold, it will behave like gold does, rising during crises and dropping in more sanguine time periods. The 21st Century Tulip Bulb: In this, the worst case scenario, Bitcoin is like a shooting star, attracting more money as it soars, from those who see it as a source of easy profits, but just as quickly flares out as these traders move on to something new and different (which could be a different and better designed digital currency), leaving Bitcoin holders with memories of what might have been. If this happens, Bitcoin could very well become the equivalent of Tulip Bulbs, a speculative asset that saw its prices soar in the sixteen hundreds in Holland, before collapsing in the aftermath. I would be lying if I said that I knew which of these scenarios will unfold, but they are all still plausible scenarios. If you are trading in Bitcoin, you may very well not care, since your time horizon may be in minutes and hours, not weeks, months or years. If you have a longer term interest in Bitcoin, though, your focus should be less on the noise of day-to-day price movements and more on advancements on its use as a currency. Note also that you could be a pessimist on Bitcoin and other crypto currencies but be an optimist about the underlying technology, especially block chain, and its potential for disruption. Bitcoin is not an asset class: To those who are carving out a portion of their portfolios for Bitcoin, be clear about why you are doing it. It is not because you want to a diversified portfolio and hold all asset classes, it is because you want to use your trading skills on Bitcoin to supercharge your portfolio returns. Lest you view this as a swipe at cryptocurrencies, I would hasten to add that fiat currencies (like the US dollar, Euro or Yen) are not asset classes either. You cannot value Bitcoin, you can only price it: This follows from the acceptance that Bitcoin is a currency, not an asset or a commodity. Any one who claims to value Bitcoin either has a very different definition of value than I do or is just making up stuff as he or she goes along. It will be judged as a currency: In the long term, the price that you attach to Bitcoin will depend on how well it will performs as a currency. If it is accepted widely as a medium of exchange and is stable enough to be a store of value, it should command a high price. If it becomes gold-like, a fringe currency that investors flee to during crises, its price will be lower. Worse, if it is a transient currency that loses all purchasing power, as it is replaced by something new and different, it will crash and burn. You don't invest in Bitcoin, you trade it: Since you cannot value Bitcoin, you don't have a critical ingredient that you need to be an investor. You can trade Bitcoin and become wealthy doing so, but it is because you are a good trader. Good trader ingredients: To be a successful trader in Bitcoin, you need to recognize that moves in its price will have little do with fundamentals, everything to do with mood and momentum and big price shifts can happen on incremental information. Would I buy Bitcoin at $6,100? No, but not for the reasons that you think. It is not because I believe that it is over valued, since I cannot make that judgment without valuing it and as I noted before, it cannot be valued. It is because I am not and never have been a good trader and, as a consequence, my pricing judgments are suspect. If you have good trading instincts, you should play the pricing game, as long as you recognize that it is a game, where you can win millions or lose millions, based upon your calls on momentum. If you win millions, I wish you the best! If you lose millions, please don't let paranoia lead you to blame the establishment, banks and governments for why you lost. Come easy, go easy! Bitcoin Q&A: Bubble or Breakthrough? I have quickly scanned your article and will digest it more thoroughly later. My major concern is whether the global economy needs yet another currency, particularly one independent of valuation metrics. Since the global economy is fundamentally an open system with continuous energy input, but with fixed quantities of physical matter, delinking currency, as a proxy for energy flows, from a physical standard (gold) has long made sense. Since the amount of energy cumulatively increases in the system over time (solar energy can be converted to chemical energy and stored) any currency should also cumulatively increase over time. With a fixed quantity of bitcoins haven't we just created an ethereal "gold standard". Even if bitcoin or other cryptocurrencies shift their focus towards transactions, don't you think the deflationary nature of these currencies is a problem? I remember reading someone bought pizza with 10000 bitcoins in 2010. I feel that I will always be buying figurative pizzas (compared to what I could buy in the future) with any of these crypto currencies, if I were to transact with them. What are your thoughts on the deflationary nature of bitcoin etc? Why do you dismiss Bitcoin as a commodity? There is a cost to mine bitcoin which is very measurable (computing power + electricity). The debate will rage on, but I'd bet almost ANYTHING that Bitcoin will be much higher in 2020 than it is today. Bitcoin is a synthetic commodity. It's supply fixed, therefore it bound to rise compared to fiat currencies, provided adoption continues. One can use the USD as savings and investment vehicle by buying US treasury bonds. Isnt that what most of the global savings glut does? Other currencies are either not safe or their associated government bonds have zero or negative yield. When we get bitcoin bonds with someone (who?) paying interest and OPEC accepts Bitcoins for oil then perhaps we have a currency contender. But then again, Since data is the new oil and bitcoin is bits (data) perhaps it is the oil! Need to flush that out for myself. Good discourse Professor Damodaran. Had your asset valuation book for Fianance class in my MBA at IU Kelley School of Business. Jamie Dimon has a point though -- the governments will step in to regulate, if not block, the crytocurrencies. However democratic the crytocurrencies themselves are, they are meaningless if they are not exchangeable with our fiat currencies, and fiat currencies ARE CONTROLLED by the governments. Hypothetically, if any country wanna protect their own currency, they could just declare buying crytocurrencies as illegal, which could impair the value of crytocurrencies overnight. Excellent piece that discuss it as an "asset class"
Would love to hear your thoughts on that article. "You cannot value Bitcoin, you can only price it: This follows from the acceptance that Bitcoin is a currency, not an asset or a commodity." This is wrong, the value of a currency is defined in terms of its purchasing power, both in terms of goods and services and other currencies! There is nothing wrong with using a criptographic code as money. In the past straw, stones etc. have been used and today we use paper and plastic. With fiat money, it is not the material used that defines a currency. Indeed, it is about time that central banks start issuing a criptocurrency. What defines a currency is WHO issues it. And this WHO cannot be a secret group or stochastic algorithm! 1) I think you dismiss commodity a little too quickly. If you Consider bitcoin a money transfer commodity. Buy this commodity use it to move money to another country (one of which probably has capital controls) and then sell this commodity. This is a use in a similar way to using oil to move your car or maybe wood to build a house. You could sell the wood when you are done with the house. Interestingly the total supply is not impacted but the supply that is available to purchase as any particular time is reduced (similar to wood) while its performing the transaction. Why couldn't it be a money transfer commodity? 2) Maybe it does have cash flows. If cash must flow into bitcoin to maintain its value how is this different than a cash storage business. Cash flows in (revenue) from buyers and out from sellers (expenses). Why isn't the cash flow the net cash flows in a money storage organization. Imagine a coop insurance company where members buy in and claims go out for providing the service of insurance. That could be a considered net cash flows. Would you say a company like that is impossible to value? @RobK - Per Dr Damodaran's definition above which I agree with, a commodity is defined in terms of it's use to fill a need. The defining property of a commodity is not that it has a cost to produce. Obviously we don't count as "need" its use as a medium of exchange in which case it is a currency since all currencies share the property of creation cost. Being the first and most accepted cryptocoin and used as base for many forks (eg. litecoin, bitcoin cash, bitcoin gold) don't you think bitcoin can - in some sense - be seen as an asset? When a fork from bitcoin's blockchain occurs, bitcoin holders receive new cryptcoins that can be sold for fiat money, thus generating a positive cash flow. Also, as cryptocoins are extremely volatile and only current holders of bitcoin receive new cryptocoins created by the forks, don't you think it also resembles real options? I read this article referencing a supposed valuation ratio for Bitcoin (see excerpt below). Is there any validity here, or is this in the same league as the 1999 practice of valuing Internet stocks based on "Eyeballs"? ... Bitcoin’s “P/E ratio” looks at the digital currency’s network value—the number of outstanding bitcoins multiplied by price; this figure is currently $44.69 billion—against its daily transaction volume. “The reason I call it a P/E ratio is because when I think about what a P/E signifies for equities, it is basically the function of market cap and earnings. The earnings are the underlying utility—the cash flow of the company,” explained Chris Burniske, a blockchain analyst at ARK Invest, who has helped to develop this metric. I have left this comment on YouTube as well, and am simply transferring it here for those who only visit this blog. Yet, it struggles to adequately fit all of these roles primarily as the result of its volatility, which hinders its use as a store of value and medium of exchange. If we think about it as a commodity, it is certainly driven by supply and demand. Yet it is not really an "input" for any particular industrial use as you note and there is no "required" floor value like you would see with something like cobalt (you can argue the costs required to mine a single Bitcoin are its floor value, yet those costs are artificially inflated and could correct if it becomes too prohibitive as miners drop off from network and difficulty adjusts downward). Here's the part where we fork in our opinion of Bitcoin. While it is NOT a cash producing asset like a company is, it does provide a service in a similar vein. It targets three major markets outside of its use case as a store of value or "digital gold:"
If one were to think of Bitcoin as a fintech company with characteristics of a currency, it becomes kind of an odd entity to classify. Theoretically, we could argue there is value based on a certain market penetration of one of those above markets. We could also argue that the Bitcoin network must have a certain market value to match a required level of utility value in its network. It also opens the door of relative valuation metrics such as market cap to transaction volume (usually on a rolling basis). The issue with ratios like these, naturally, is that it is tough to say what is and what isn't a fair multiple while this is a much easier task in equities because we can take any multiple with stocks and flip it to find a more intuitive metric (e.g: earnings yield). We have plenty of data to support what is and what isn't fair in equities, but none in cryptocurrencies. All of this is to say, this is just the beginning of a long road for identifying what exactly cryptocurrencies are. I hope your views aren't solidified yet - mine certainly aren't, because there is plenty still left up for interpretation. Thanks for the post Professor. On Bitcoin, I think what you may be missing is a much larger point around what Bitcoin is - it's more than just money, it's a protocol for value transfer. And we're talking about technology here. It's the first time 2 people anywhere in the world can transfer value without a third party - this is classic disruption. Money for the first time is programmable and that opens up a completely new way of thinking of money and its applications. All the characteristics of Bitcoin point to it being the best form of money we've known. Problem is currently no one wants to use it and that is because of its massive rise in price. Gresham's Law explains this well (http://www.investopedia.com/terms/g/greshams-law.asp) Bitcoin does to money, what the internet did for information. Any good currency has 3 phases: Store of value -> Payment and exchange -> Unit of account. And currently it is a great store of value - this depends on your time horizon. There are massive fluctuations of course, but if you've held Bitcoin over the past years, everyone knows what that has resulted in. Data shows that volatility has actually gone down over the years and as more people continue to get into the crypto world we start reaching a critical mass of users, whereby the payments use case then makes sense. I do agree with you on Bitcoin being a curreny - most people are confused about this. But it is how it was intended to be. Keen to hear your thoughts. Regarding the time horizon distinction between pricing and valuing, how do you reconcile this with the people who, for example, purchased Bitcoin in 2014 and are still holding on their purchase? I understand that this is classified as trading as is there is no intrinsic value that be derived, and therefore no price for Bitcoin to converge on. However, I'm confused since this time horizon of 3+ years clearly falls out of the "Pricing" category and into the "Valuing" one. Is time horizon more of a 'soft rule,' so to speak, or am I missing something? The section regarding "Pricing Game" and "Value Game" is the best writing I have read regarding investing so far. The 4 category of things are so crystal clear articulated to understand it makes me want to cry. I have read all Warren Buffet's Chairman's letters and like his value investing theme but his easy dismissal of pricing game never felt right to me (many people makes a lot of money from the pricing game after all). But this article and the table listing the pros/cons of the Pricing Game and Value Game just so valuable, especially this section: "Most Delusional Player A trader who thinks he is trading based on value. A value investor who thinks he can reason with markets.". This is the hidden gem in this article. Thanks. I quote "A commodity derives its value from its use as raw material to meet a fundamental need." No-one fundamentally needs Bitcoin as a raw material. I wrote a post a few months ago that with a very similar thesis. The only difference is that what you referred to as the difference between trading and investing is for me the difference between investing and value investing. But it's just a difference in terminology. Do you not think it would be better to use the more general term "money" to describe bitcoin and gold. The term "currency" is associated with coins and notes and so seems to imply mostly a role as a medium of exchange which neither gold nor bitcoin are currently very useful as. However both bitcoin and gold perform some of the roles of money, at least for some part of the population. Although you say bitcoin can't be valued since it is a currency, your article does imply a way to determine a "fair" price. You take your 3 possible paths for bitcoin, assign a best guess probability to each one, and reason about what the price would be if that path came about. Multiply the possible prices by the probabilities and add them together to get a "fair" price. If you think about it this is not very different from how you would value an asset such as a stock and decide whether it is "undervalued" and thus a good investment. Bitcoin has not yet become what it will eventually be, and thats why I think one can talk today about how to "value" it without contradicting your view that currencies can't be valued. If bitcoin does become a currency one day (for example), then its price will reflect that and it won't make sense any longer to try and "value" it. Doesn't a currency have a future cash benefit based on acceptance? For example, imagine a store that only accepts bitcoin. If a customer doesn't own bitcoin, he will need to exchange other currency for bitcoin to shop at the store. This exchange will have a cash cost that is saved by owning bitcoin. Also, the products at this store may have a cash flow difference from what is available in other stores, which value can only be accessed with bitcoin. Both of these items are future cash flows that can be valued. (similar to relative value pricing with sovereign interest rates). What am I missing? Thanks. It would seem that if an asset has value, then the currency that can be used to purchase that asset also has value. This is because the currency is an option to purchase the asset at the asset's price, which can be below value. I am a personal financial adviser from Russia. I really liked your article "The Bitcoin Boom: Asset, Currency, Commodity or Collectible?" Сan I translate some of your article into Russian. I want people in Russia to hear your opinion about bitcoin. It's a reasonable bet, but it's based on pricing, not valuation. Understand: putting money in a currency because it will be priced higher in the future (according to your research and instincts about the market) is not the same as putting money into private equity, where someone sees the value in a distressed company, fixes it up and sells it at the correct value. In the latter case, we're speaking valuation: the investor is not acting on his konwledge and instincts of the market, but on his knowledge and instincts on the value of the firm -- i.e. on the discounted cash flows of profits into the future. He never says it's going to be higher or lower, he says the methods of valuation and investment say nothing about this; and he's good at valuation, not trading. That's a strange scenario. It assumes stores will stop accepting fiat, which means the ability of central banks to make monetary policy will collapse. There's a disputable but cogent argument that the Great Depression arises out of a premature return to strong (non-fiat) currency after the world war; and the entire economy of the developed world is precariously sitting in a quantitative easing bubble that would pop too quickly. It could mean the return of bread lines. It's also a scenario where Gresham's law is somehow averted. This probably happens only if fiat currency has stopped circulating completely and there's no value to be had for stockpiling bitcoins rather than accepting and spending depreciating fiat currency. At this point, there would be no non-bitcoin stores. It's a weird dystopia. I am stunned by some of the comments here. Almost like people read the article, but were just waiting to say what they wanted to say. For this entire argument we need to agree to term definitions, which Prof D explicitly presents. If you don't agree with these terms, the rest is likely moot. Given those definitions, it is clear that Bitcoin is a currency. Gold, as is pointed out, has some commodity features, however, predominately, it's features and utility are that of a currency. Much as in Hamilton's day, the issue most relevant at present appears to be trust of the issuer and acceptance of participants. If folks agree to trust in bitcoins basis and the rules around quantity, mining etc., it could thrive. However, governments around the world present a real threat. Tom Lee of Fundstrat published an interesting article around Bitcoin valuation (I agree with AD that this is a price, nothing more) as a function of Metcalf's law and how the network effect provides a compelling framework for acceptance and adoption. Prof, It seems that you are missing out the larger debate on bitcoin and blockchain, I remember you saying that finance needs a disruptive change as it is a very badly run business (like teaching and writing), and I believe that blockchain is perhaps that change. As this blog is old (in terms of bitcoin pricing, 17k as I write this) perhaps you need to share updated thoughts in the subject especially with the launch of CBOE and upcoming launch of CME. Interesting breakdown, but you're being way too binary in describing things as non-assets with no value if they don't have identifiable cash flows. This binary definition, as you state, means that things like currencies can only be understood as having random price movements, without any thinking about value. This is obviously wrong. 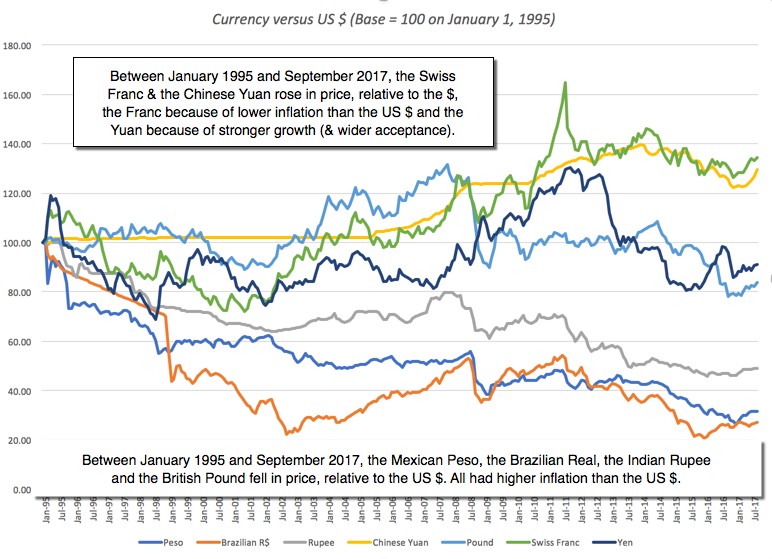 The relative prices of currencies fluctuate with some randomness, but also a lot of fundamental characteristics, like economic growth, monetary policy, and fiscal policy. To be a store of value *is itself valuable. * The creator of Bitcoin was explicitly conscious of this, likening his invention to gold. While it is certain that some of Bitcoin's value is driven by price speculation, a substantial amount of it is driven by those who believe that contemporary fiscal and monetary practices in the industrialized world are unsustainable, and therefore that fiat currencies are not a reliable store of value. To believe this is not to be a speculator; it is to have a fundamental thesis about the fate of industrialized economies. Hence, your breakdown would benefit from giving some thought to how one can have a long-term thesis about Bitcoin's price (or the price of any other "asset", or pick your preferred term) even though Bitcoin has no cash flows. Right after the news hit the market, the price of Bitcoin fell below $11,000 and Ethereum fell to $1,174. While many analysts and experts believe that while South Korea may be seemingly attacking Bitcoin, the real-name bank accounts system will give more security to investors and to the market. The country has been trying to tame the heat recently and the South Korean government now believe this is the way to do it.